Words, by repeating their connotation, their application seems to follow rather rigid schemes, hence we might even think that, after all, words work. Authority depends on making words effective. Don’t move! Stop! Words that are not only verbal but follow a series of physical gestures as well, that we should understand, not question. Now let us enter this door in the picture above. After all, there is written welcome. If there would be a person behind that door we would be told we are not allowed to be there. “Have you not read there is written No Entry?” Well no, we focused on the welcome, and would a welcome not be open to all? This is not how it works, and we do understand this. Even when the combination of more words clearly carries along a form of incongruous meanings, most often the no rejects the yes. Being human is to be ambivalent by nature. We cannot avoid contradictions within our own selves, a plural reading of meaning, of relations. But somehow we have learned that property is connected to prohibition. Exclusion is our logic. Hence this is why, in our language, a welcome can be offered to some but not to all? Thank you, Tessa. It is the kind of photo which is not too strange to the philosophically minded, but I watched the surprise as one not philosophically minded studied the photo: 'But ...!' What caught my attention in this piece is the tendency to privilege the negative, the no. Perhaps precisely because it refers to the yes, or is incongruous with the yes? After all, psychologists say that we respond to the 'unexpected', or as Quine put it, the expected which fails to happen.
" we respond to the 'unexpected', or as Quine put it, the expected which fails to happen. " - which is also the root of many of our jokes...? Hence there is alsmost a humorous aspect to this picture? 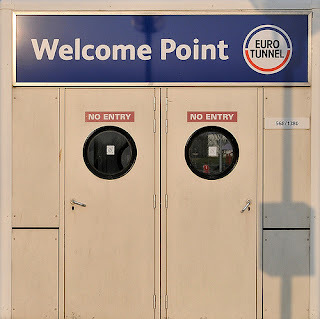 The seeming incongruity here between ‘welcome point’ and ‘no entry’ reminded me of the intense (and illiberal) brouhaha over values being played out in many countries over migrants and who’s worthy of entry. That is, a years-long social and political mêlée over stark lines drawn between some governments’ inclination to ‘welcome’ migrants and those nations’ concomitantly, oddly inconsistent rejection of migrants (‘no entry’) under the harsh pretext of law.